join us for SCCA autocross! Autocross is a relatively low-speed timed competition in which one driver at a time negotiates sweeps and turns defined by cones. Click on <this link> and be taken to the Events Calendar for a list of the Autocross events with details and registration links once they’re available. We run Schools and Championship events from March through September. We’ve always got something happening. Our primary event location is FedEx Field in Landover, MD. Published schedules can change once the preseason football schedule is finalized. Check back frequently. Past events during the year are at the bottom of the list. All eligible competition classes will be arranged into two Sessions which shall be constant throughout the season. These Sessions shall alternate the time of day they run; in the morning one event, and in the afternoon the next. Run groups cycle through the available Heats over the course of the season in order to ensure that all competitors run at all possible times of the day. Within each Session, there shall be two (2) or three (3) Heats of competitors, depending on the number of registrations; Heats 1, 2, and 3 for a morning Session, and Heats 4, 5, and 6 for an afternoon Session. The first heat of the afternoon session is always designated heat 4, even if only 2 heats actually comprise the morning session. The Ladies Classes will run with their respective open classes. Junior Karts will run immediately prior to the 4th heat in their entirety. The SCCA AutoCross Committee reserves the right to adjust class distribution within a session for event balance but shall communicate the final groupings two days before the day of competition. In practice, this means you may find your Heat changing within the half-day you are competing, but you will not find yourself moving from morning to afternoon, or vice versa. To find out which run group you will be racing in, click on the View Entry List (icon of a red car) in the event listing on www.dlbracing.com (online registration location for an event). Every participant is expected to help and volunteer for a Worker Assignment. Please review the Worker Assignments section for details. Please review the Spectator guidelines. + where are autocross events held? The course is generally laid out in a large parking lot or airfield free of obstructions. The Washington, DC region uses the large parking lots surrounding FedExField. The cone positions are marked with boxes of chalk, drywall, or large crayons on the course. Courses are specifically designed to be both entertaining and safe. The course usually takes about a minute to negotiate at speed. Before driving the course, all competitors are given the opportunity to walk the course to familiarize themselves with the design. Almost no two autocross courses are the same, and learning the course is part of the challenge. + what if i hit a cone? Cones are counted as a two-second penalty added to the run time for each cone hit. A penalty is applied only if the cone is knocked down or displaced from its marking on the pavement. If the cone is hit and any part of the base of the cone is touching the marking box on the pavement, no penalty is applied. + will cones hurt my car? Generally, no. The cones are constructed of soft plastic, and they deform when hit. They will occasionally leave slight marks on the paint and wheels which can be removed easily with car polishes. + do i need a special license to autocross? No. Most local events are open to the general public, and only a current state-issued driver’s license is required. Some specific clubs will limit entrance only to current club members. Most SCCA events are open to the public, and many of them offer a discount to current SCCA members. + do i need to wear a helmet? Yes. Insurance regulations require that all autocross participants wear seatbelts and Snell-approved helmets during all runs. Helmets must either meet the current or two previous Snell standards. These standards change every five years. As a result, helmets with the 2010, 2005, and 2000 Snell standards are currently acceptable. Loaner helmets are available at the local WDCR SCCA events. + is my car okay to autocross? Most vehicles are acceptable for autocross. The exceptions are vehicles with a high center of gravity, such as SUVs and tall pickup trucks. Virtually all types of vehicles, from station wagons to open-wheeled racecars, are welcome to participate in SCCA AutoCross events. Vehicles competing in each event must pass a general safe inspection and must be emptied of all loose items. + is there anything i need to do to my vehicle? At the very minimum, the vehicle needs to be in good running shape. No leaking fluids are allowed, the suspension and steering should be tight, the tires should be in good shape, and the brakes should be solid. Before competition, all loose items (including the driver’s side floor mat) need to be removed from the interior, and the tires should be inflated to about 5-10 PSI over the usual street inflation pressure. Some clubs (including the Washington, DC Region SCCA) have an air compressor available on site. Many competitors bring their own portable air tanks to adjust tire pressures on site. + what if my car isn't modified for autocross? All the better. Modifying your car will often place you in a more challenging class. 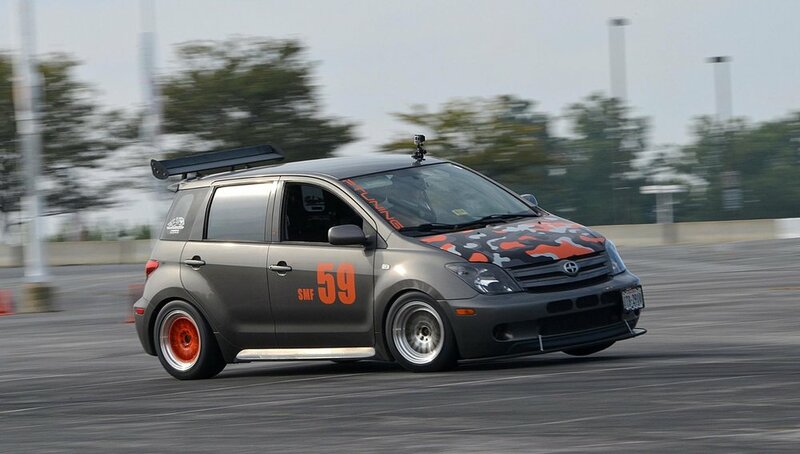 Autocross is primarily about driving, not about modifications. Modifications can make your vehicle perform better, but it is ultimately the driver that will make the car faster. Knowing which modifications are legal for which classes is beyond the scope of the average person entering the sport, but you can find all the details in the SCCA AutoCross rulebook or on the National SCCA website if you’re interested. + how much is the entrance fee? Entrance fees for running most local events range from about $25 to $50, depending upon the club, the number of runs, the quality of the venue, and the format of the event. Entrance fees can cover the cost of insurance, lot rental, trophies, and the cost of the equipment for running the event. For Washington, DC region events, the entry fee is $48 for SCCA members, and $63 for non members for registrations up to and including Wednesday before an event. If you register Thursday, Friday or Saturday before the event, registration is $10 more. You must cancel by the Wednesday before the event in order to receive a refund; cancellations after that will not be refunded. You must notify the Solo Chair of your refund request on the day you that you cancel, else your refund will not be processed. Each competitor receives four runs. Non-competitors are admitted free of charge. + how long does an event last? Most autocrosses are full-day events. The majority of the competitors are present for about half the day, but some choose to stay at the event to watch or work. The Washington, DC region events are split into morning and afternoon sessions, and most competitors are present for half the day. + what should i bring to an autocross? Bring gear appropriate for weather conditions. If rain is predicted, be prepared with umbrellas, tarps, etc. If it is sunny, bring sunscreen and drinks. Bringing food is always a good idea, although some clubs offer on-site food sales. Folding chairs are always useful. Cameras are allowed at most venues. + does my vehicle need numbers? Virtually all autocrosses require easily visible identifying numbers for each vehicle. At WDCR SCCA events, large visible numbers and class letters on each side are mandatory. Bigger is better, and good contrast is important for visibility. Most competitors use magnetic numbers and letters applied on the sides of the vehicle. If you don’t have magnetics or have a non-metallic vehicle, be creative. As long as the numbers and class letters are visible during the runs, you’re fine. + can i come to an event and not compete? Absolutely! It is highly recommended that you attend at least one event to learn the basics before participating. You can see how the event flows, watch some runs, walk the course, and talk to the competitors. Depending upon the club managing the event, you may even be able to take rides with the competitors! + how do i sign up for events? Most clubs now offer an online pre-registration system. Some have online payment available. Online registration for WDCR SCCA AutoCross events is available at http://www.wdcr-scca.org/calendar. + how do i know what to do when i arrive at the event? This is where attending an event beforehand can be helpful. Regions differ in the format of their events, although most are relatively similar. In the Washington, DC region, you begin by signing a liability waiver at the entrance. After that, you go to a registration area to sign in, show your driver’s license, and receive your worker assignment for the day. Next, you should get your car ready and go through the vehicle safety inspection (often called “Tech Inspection”) and move your vehicle to a gridding area. You will need to walk the course a few times to become familiar with the layout. More time spent walking is always better to learn the course fully. Finally, you will take your runs and perform a work shift, although not necessarily in that order. + i already paid for the event; why do i have to work? Autocross is a true “grassroots motorsport”, meaning that the entry fees are intentionally kept low to make it accessible to everybody. Much of the cost savings are realized by employing the competitors as workers. If paid workers were required for every position at an autocross, the entry fees would skyrocket. At most events, the competitors are only required to work for an hour or two, and many different types of work assignments are available to suit individual abilities. + are pets and children allowed at the events? Pets are not appropriate at autocrosses. If you absolutely must bring your pet, make sure they are comfortable and either fully supervised or secured well away from the action of the event. Young children should obviously be supervised at all times, and older children should be instructed about safety at the event. Insurance regulations require all minors to have a parent or legal guardian sign a minor waiver at the entrance. Safety is always a paramount concern at all autocrosses. If in doubt, please make alternate plans for caring for the kids and pets for the day. + what do i win if i drive well? Most local autocrosses offer some form of trophy (plaques, engraved mugs, T-shirts, etc.) to the top drivers in each class. Some even offer small cash prizes. Don't expect to get rich by autocrossing, though! Serious prize money and awards can be obtained by finishing well at some national level events, but this is often offset by the cost of entry fees, travel expenses, and equipment purchased for the vehicle. + i'm hooked. how do i learn to get faster? Practice. Then, practice more. Unless you have Mario Andretti’s DNA, you’re probably not going to be the fastest driver in your class on your first day of autocross. There’s a learning curve to every sport, and autocross is no different. But, there is a way to get tons of practice without spending years autocrossing. Go to school. 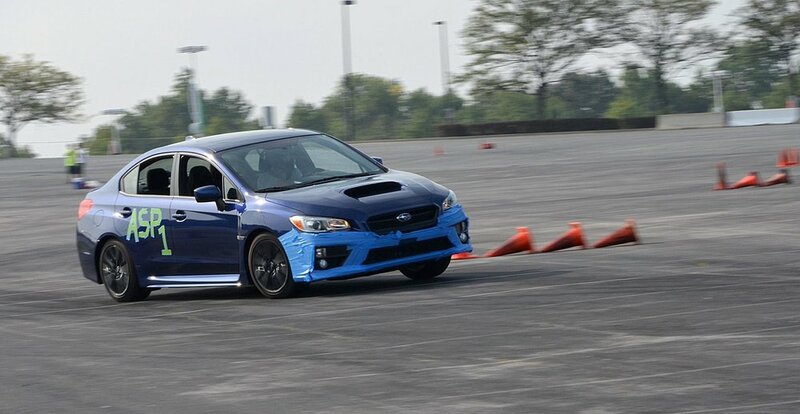 There are autocross schools available, and the DC region has a great program geared toward many different skill levels. With a school, you can get an entire season’s worth of autocross runs in a single day, and skilled instructors can help you find the best way to negotiate the course and get the most out of your own car. Like any sport or hobby, you will learn the ropes through direct experience and time. Feel free to use the wide knowledge of the competitors and committee members to learn more about Solo. SCCA Members: $48 and Non-SCCA Members: $63 for registrations up to and including Wednesday before the event. Registrations on Thursday, Friday or Saturday before the event are $10 more. Competitors can register for the WDCR Season Subscription on www.dlbracing.com until registration opens for the first event of the season, the Practice Event. Cost for the Season Subscription is $310. Please note that the cost single events is $48 for SCCA Members, $63 for non-members. Buying all 8 events individually is $384 as an SCCA Member, so buying the Season Subscription gets you almost TWO free events!! The Season Subscription is NON-REFUNDABLE and NON-TRANSFERABLE. When you click the check box at the bottom of the attestation, register, and pay for this subscription, you are agreeing to these terms and conditions. ALL event dates are subject to change per contractual agreement with the venue, FedExField, home of the National Football League's (NFL) Washington Redskins. There will be no refunds for events that you cannot attend due to an event date change dictated by FedExField. 3. The opportunity to select a permanent number within your class for the season. You will be pre-registered for each event with the car, class and number you have selected at the beginning of the season. If you change cars or classes, you will be given the option of selecting a new number from those remaining in that class. The National Pro AutoCross is NOT included in this subscription. The Season Subscription is open to SCCA members only and membership numbers will be verified by the system upon registration. Points earned in other classes are not transferable. If you cannot make an event, you must cancel yourself on the dlbracing.com site by the Wednesday preceding the event date or risk losing your subscription number for the remainder of the season.